(left to right) HAKUIN Ekaku (1685-1768) Zazen Hotei ; HAKUIN Ekaku (1685-1768) Lotus pond Kannon ; Ito JAKUCHU (1716-1800) painting, TANGAI Musen Jozen (1693-1764) inscription, Giant Daruma ; Ito JAKUCHU (1716-1800) painting, ROSHU Ensho (c1769–1789) inscription, Kanzan and Jittoku . All works from the Gitter-Yelen Collection. Simple yet profound, spontaneous yet controlled, the art of Zen Buddhism communicates the vision of Zen masters and reveals the essence of Zen. 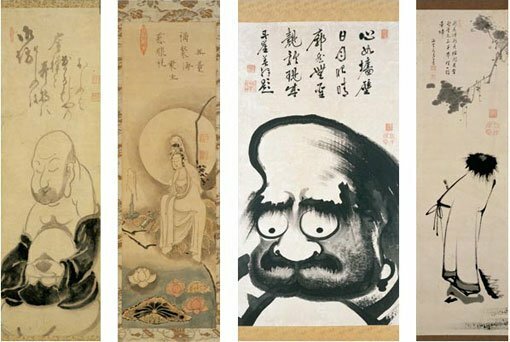 Brimming with wit and humour and bristling with spiritual power, these intensely Japanese works of Zen ink painting and calligraphy, are immediately appealing. The exhibition, drawn from a remarkable US private collection, includes works by the greatest Zen masters of the last three centuries, with subjects ranging from fierce-looking Zen patriarchs to minimal landscapes and from intense calligraphy to whimsical depictions of Zen conundrums.